Pedro Almodovar is probably one of the most interesting auteur directors working today. His trademark reliance on melodrama, sexual perversity and avant-garde showcases produce strange and infinitely interesting masterpieces. Sometimes he misses the mark like in a movie I reviewed a couple of weeks ago, Flower of my Secret. But other times he is able to get the mixture just right and produce a truly moving exploration on the nature of love, like he did with Talk to Her. The film starts with a strange ballet. We see two women who seemingly can’t see stumbling around a stage full of chairs. You think that they would trip over the chairs, but a man comes out and hurriedly pulls the chairs away from the dancing women. In the audience are our two main characters, Benigno and Marco. They don’t know each other and yet they sit next to each other. Marco shows an unabashed show of emotion while watching this ballet. Benigno is struck by this show of emotion and tells the patient he is taking care of, a ballerina who has been in a coma for four years, all about the incident. Benigno seems to have a loving and affectionate relationship with a woman who has no knowledge of his existence. He loves to take care of this young woman. As fate would have it, Marco’s companion, a female bullfighter, has an accident and slips into a coma as well. She is placed down the hall from Benigno’s charge. Marco comes everyday to keep his bullfighter company and meets Benigno. They strike up a friendship. Over time, Benigno reveals that he is obsessed with his charge, even before she slipped into a coma. He does the things that she can not, like go to the ballet and the movie theater, just so he can be close to her spiritually. This affection and obsession turns dark for Benigno. Marco stands by his friend and keeps his company until the very end. Although Almodovar is more famous for giving great and complex roles to women, men dominate this picture. But these men aren’t of the same fiber we usually see in the hyper masculine Hollywood films. They seem to have overt feminine traits and are unashamed of them. Marco cries several times throughout the movie and is unafraid to talk about it. Benigno gives off homosexual vibes, despite being in love with a woman and enjoys skin care and hair styling more than nursing.The men devote a good portion of their day-to-day lives caring for men in an affectionate way. It is refreshing to see men act more on a spectrum; somewhere between male and female. It is truer to life and gives this film more emotional resonance. One of the greatest strengths Almodovar shows throughout all of his friends is his affection for art. 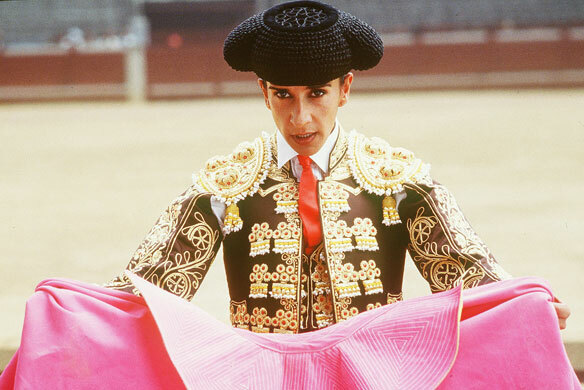 Each character in this film is devoted to some kind of art form, whether it be ballet, bullfighting, journalism or watching movies. The way Benigno connects to his comatose patient isn’t through her words or deeds but through art. He feels closer to her after he goes to the movie theater and sees a silent picture (there is a great silent picture sequence that is hard to forget.) or watches an avant garde performance. Marco is moved to tears by music, ballet and basically anything he finds truly artistic and beautiful. This is what Benigno found interesting in him in the first place. When one devotes one’s life to art then you feel a kinship with people who do the same thing. When the comatose patient (spoiler!) finally awakens, it isn’t her family that we see. Instead we see her watching a ballet class and looking wistfully at the dancers. When the bullfighter gets rejected by one of her ex-lovers, she devotes her time to fool hardy and brave bull situations. Not only do the characters talk about art, we get to see long sequences of artistic performances. From the strange ballet performance (which was performed by the famous dancer Pina when she was still alive) to the silent picture sequence to a sweetly mournful Spanish traditional song, we get to see what has put these men and women under such a spell of epic portions. These sequences give us a little break from the narrative, but also enhance the emotions of it. I would like to see Almodovar delve into documentary filmmaking and make a movie about dance. He can film it so well and fill the frame with unrestrained enthusiasm for the craft that I think he would make a truly interesting dance documentary. For now, I am content to watch the dance sequences he peppers all of his movies with.